This Week, Erykah Badu Saved Our Souls. 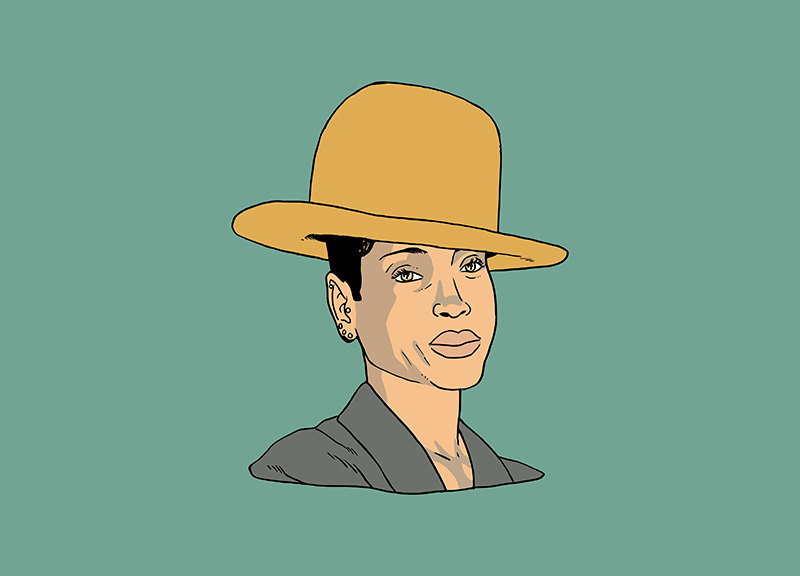 Building on her tremendous buzz from last week after she called out Will.i.am for biting her style, Erykah Badu struck while the iron was hot this week, dropping a new world-saving mixtape. It's always thrilling when the Q.U.E.E.N. slaps her name on something — that much was evidenced by the fact that the thing was pretty much immediately embedded on sites all over the country and gushed about endlessly here in town. — but the fact that this was just a collection of soul-minded, life-affirming tracks from other artists shows her real strength. 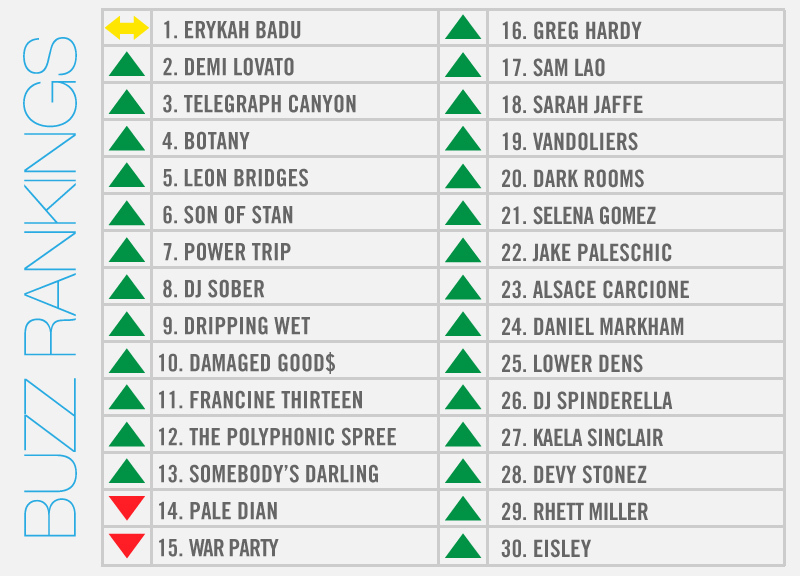 To update last week's running totals, this 10th time atop our Buzz Rankings for Ms. Badu now ties her with Leon Bridges for second all time, still behind Sarah Jaffe's 12. Pretty impressive stuff just the same. Meanwhile, a newly-released Spotify session and bit of Deep Ellum busking helped Bridges do pretty well in this week's rankings, too, following last week's extremely rare absence from the list. Other new releases, like Demi Lovato's “Cool for the Summer” video, Telegraph Canyon's first LP in six years and a new, Gorilla vs Bear-approved Botany tune helped those acts perform well in this week's rankings as well. Big shows helped bolster others' positions, too. For instance: Power Trip was announced as part of the next Sound Select show; Lower Dens and DJ Sober will perform at this weekend's fifth annual Gorilla vs Bear showcase, Son of Stan threw a raging pool party at Shipping & Receiving; and Pale DÄ«an played its last show as a Dallas band. Elsewhere; The Polyphonic Spree and Eisley were announced as part of the Oaktopia bill; Dallas Cowboys defensive end Greg Hardy “released” a new LP; and Dripping Wet said goodbye to some members. Cover illustration of Erykah Badu by Arturo Torres.